Topics covered so far include: Mills, Farming and Settlement, World War 1, 1851 and 1871 Censuses, History of Blackshaw Chapel, the Life and Times of Gordon Sutcliffe and, in 2009, Sport, Holidays, Entertainment and Days Out up to the early 1950’s. You are very welcome to join the group, no prior knowledge is necessary, only enthusiasm and a sense of humour! Meetings are held throughout the year on the second Monday of each month at Hippins Farm at 7.30 pm. This may vary occasionally, please contact a group member to verify individual dates. Blackshaw Head Chapel is two hundred years old this year! 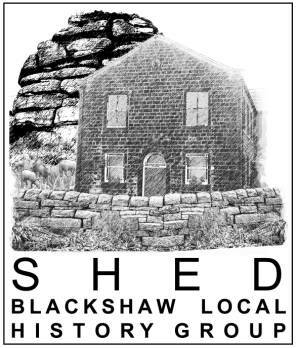 ‘Scan – 2 – Save’ event at Blackshaw Head Chapel, in conjunction with Shed, on Saturday 25th April between 11 am and 3 pm. If you have photos or any other items to share they will be on hand to scan and record them. Refreshments provided.